Hello everyone! It's time for a halloween punch art blog hop! After checking out my happy monster tutorial, please visit the other blogs on the hop to see their halloween punch art creations! The list of hoppers is below my tutorial. Please note: the hop is scheduled for 8 am central time. If you are checking earlier than that and don't see some projects on some hop stops, this is the reason. Thanks! 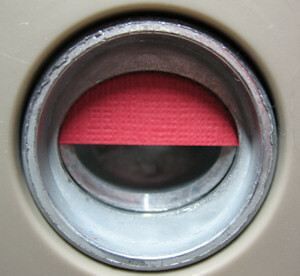 1) To create face, first punch half of the medium oval in ruby red. Line up the 1 3/8" circle over the top and punch the crescent shape. Round out the flat edges. 2) For the arms, first punch the small oval in ruby red. Line up the large oval over the top of the punched hole and punch the arm as shown. Punch 2 of these. Round out the ends. 3) Punch out the rest of the pieces. 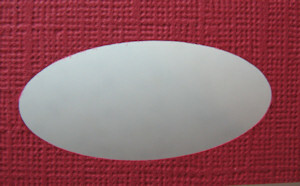 Clip one of the small ovals and the large ovals as shown. Clip the petals apart on the 5-Petal flowers. Clip 2 petals off each medium boho blossom to create the paws. Clip off the points on the decorative label. Clip 2 petals of the large boho blossom off to create teeth. 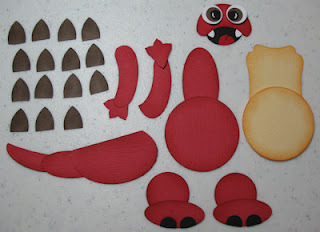 4) Sponge the edges of the ruby red pieces with riding hood red ink. Sponge the edges of the so saffron pieces with more mustard ink. Sponge the edges of the soft suede pieces with soft suede ink. 5) Glue the eye layers together. Add highlights with a white uniball gel pen. Glue teeth onto face piece. Glue the black mouth piece onto back of face piece. Glue on tongue piece and clip away excess. Draw detail with zig pen. Attach eyes to face with dimensionals. 6) Attach belly to body piece with dimensional. Attach face to top of body with dimensional. Glue large oval onto center of 1 3/4" ruby red piece to create the back. Glue the back onto back of saffron body piece. 7) To create the tail, glue the whole small oval onto the wide oval. Glue the clipped small oval onto the small oval. Glue tail onto body. Glue spikes onto top of head, down back and along tail. 8) Glue small ovals onto 1" Cricles for legs/feet. 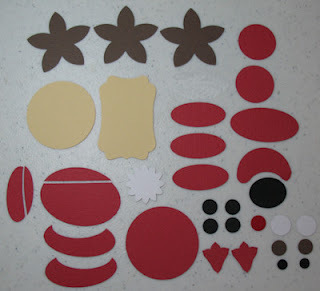 Glue 3/8" circles onto small ovals and clip away excess. Attach front leg onto body with dimensional. Glue back leg onto body. 9) Attach paws to arms with dimensionals. Attach front arm with dimensional and glue on back arm. 10) Create treat tube box following the cutting and assembly instructions HERE. I used nickel coin tubes. 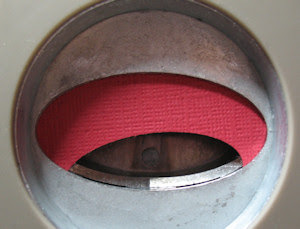 Wrap designer papers around the cap rim. 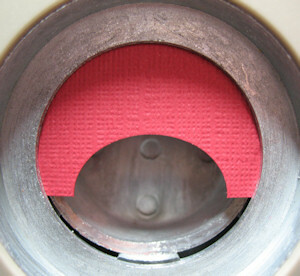 Attach 1" punched circle on top of cap. Glue punched bats on tops and sides of caps. Please visit these other blogs for some great halloween punch art ideas! LOL! Love your monster. Way, way, way too cute! You are a punching genius! This is amazing. Thank you so much for sharing and giving the info on how to make this. I will be making my own monster for sure. Now how cute is this?!?! Very clever, Kim! OMG!! This is amazing!! I can't wait to go make one myself!! OMG! 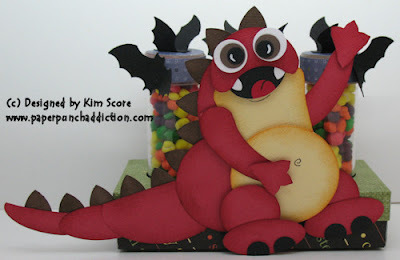 Kim this monster is amazing and your tutorial is the best!!! Wow, great monster... to be in your head for one day! Tks for sharing and creating the Halloween punch art blog! This is the cutest thing I have seen in a long time! I love him! Very creative! Thanks so much for sharing. OMG Kim, your monster is incredible, so adorable....I totally LOVE him!!! This is a monster of a project and so adorable! I bet his tummy is full of candy! Wow! How do you come up with this stuff?! Amazing! Great tutorial... what a cute monster you made. So creative! That is the cutest monster I have ever seen. Great job. WOW! that is so cute - thanks for sharing your art with us! Your creative genius astounds me! the Peachy Keen DT. I love your website and your work. Love to also do punching to create. Looking forward to seeing your beautiful work. ACK! KIM!!!!! I didn't see this one the first time around! I absolutely love it! You rock, sistah!